LINER NOTES ON GHOST WALTZ/WPA 15. 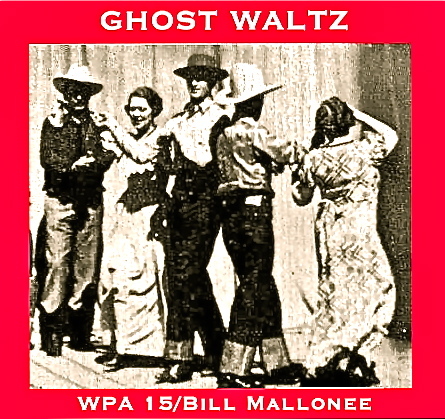 The “characters” on Ghost Waltz/WPA 15 are mostly the forgotten. The confused, the losers, the dreamers, the thieves, the found, the lost…and the salt of the earth. They come to you here as ex-boxers, dust bowl drifters, dogged believers, compassionate skeptics, ramshackle loners, wise fools, whiskey drinkers, braggarts, fearful, love smitten dancers & charlatans. I count myself all of the above. And they are all hallowed, graced, bathed in light. Sometimes a believer in Love, always a debtor to Grace. I am one who has made a “career” out of resting in the moments as they go past. Love your life. Love your brothers & sisters here. Be merciful to yourself and all you meet. And: If every moment is hallowed & unrepeatable, then embrace each one. Desire them like the gold out of a Ft. Knox vault. Drink them in like a shot at “last call.” Stumbling & dazzled, yearn for them like some Helen of Troy. Enjoy the mystery. Seek their hallowed-ness. And, if need arises: Stare down the devil. For me, it has been a place where one can open himself up to a spirit that is in motion, alive and breathing. I started to write more than ever. And you know, I’ve always written a lot. I’m usually unable to take the work, in it’s fullness, on the road these days. Lack of resources & connections make it hard to keep a full band employed. I tour as a troubadour & as a “freak.” My generous wife, Muriah, picks up the lose ends & makes sense out of them. I just write & write, tour & tour, ramp up and do it again and again…A veritable rinse & repeat artist. They say if you do what you love you’ll never work a day in your life. I’ll say that’s true. What the hell happened when I learned my first chords at the ripe old age of 31? Something like a dam burst. A fortress crumbled. Some world of pain, joy, confusion, doubt, elation & darkness emerged the day I learned 3 chords on a guitar. From then on “it” sought a nomenclature. I wrote to “save myself.” I’ve never written with a particular audience in mind. It has been, to my mind, a sort of excavation. An unearthing, if you will. Songs have become a type of anthropology. A way of dusting off a “find,” of holding a possible treasure up to the light and wondering what it is you’ve discovered. And of asking if it has any value or not. It has been a journey into a deep mine of discovery of word, sound and songs. And it, thank God, it has been a way to access my own spirit. I’m glad when the “discoveries” resonate with a few who see themselves in the same dark mine. Perhaps, we recognize each others grime-y faces. I suspect I will never “return” to the surface. America. What in God’s good Name is it anymore? A good idea gone bad? I wondered as a youth about this America. Wanted to be part of it; this something big and wild and real. Wanted to see that it was authentic. This thing that called forth the heroic in everyone. To hell with it’s wars.To hell with it’s misplaced faith in power, & re-tooled colonialism & unbridled greed. Something or someone stole the dream from us. We show up in the 2000-teens afraid, parched, weary, dead and dying. feeling powerless. As a youth, I immersed myself in media that held forth some iconic depiction of the the “American Experience.” Usually it was derived from the Old West.. Whether it was cowboy short stories, or Hollywood stereotypes in shows like Gunsmoke, The Ponderosa, Sky-King, Bonanza, or dozens of John Wayne movies, I was always struck by this fact: A person could believe in themselves. He could be a hero, great or small; Could be a kind captain; one of his own destiny; Could be a person of integrity, championing justice, equality, fairness & compassion…and maybe even get the girl in the end. And if so, do these people still exist? I can tell you unequivocally: Indeed, they do. I meet them by the scores on every tour through out this great land. I meet some of them everyday. There is one inside your own skin right now. Cast o’er the side all the sham & false that one is seduced by and told to build a life upon. Whenever I go for walks in the sun-drenched arroyo (a bone-dry steep-sided river bed), I am constantly impressed by the fact that everything, stony cliff, rutted canyon, pine, sage, rock, sky and clouds “look” new. “God-crafted” & New born. and THANK YOU for letting my work have a place in your life. I count such a vocation as an honor. Still there? Bravo if you are! I’m lucky: I get to “send you off” now. I wish for you joy as you listen. And Joy & Courage on the journey you’ll continue to make today, tomorrow, & forever. Life? She claims all you have. Wounded we came into the dance…and wounded we leave. Be a light. For yourself and for others. Because the “ghosts” need it. Because, you & I need it. The longer I live, the more I’m sure that these journeys we make are hallowed ones. Hallowed, Graced & bathed in Light.